This paper describes some of the main regulatory challenges underpinning the restructuring of electricity markets in the EU. If energy markets are to remain the instruments that enable long-term policy and innovation initiatives, new regulatory arrangements are needed to reconcile the security and competitiveness of sustainable solutions. Promising reforms are outlined (e.g., in the electricity market time and spatial scales), with the objective of properly distributing costs and benefits among current and emerging actors. However, several aspects and interfaces must be properly understood to govern the evolution of the electricity delivery options and services. 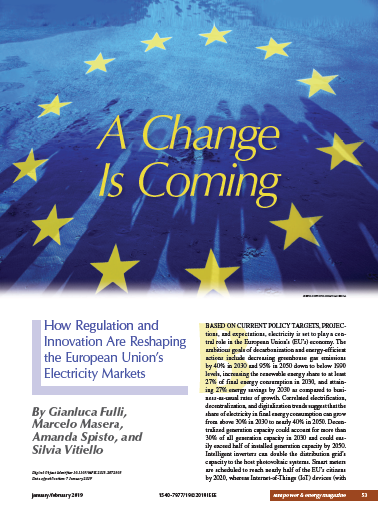 We first analyze how policy decisions have contributed to developing the present EU electricity system and markets. Then, we illustrate new policy and regulatory initiatives that aim to redesign the EU markets. In conclusion, we share some thoughts on the interplay of regulatory and technical advances and their impact on future power systems.